This watch, one of Cartier’s new pieces to be introduced at SIHH later this month (January 2016) shows that there is still plenty of room to invent new functions and new styles of display, as long as you have the capability of designing your own movement. 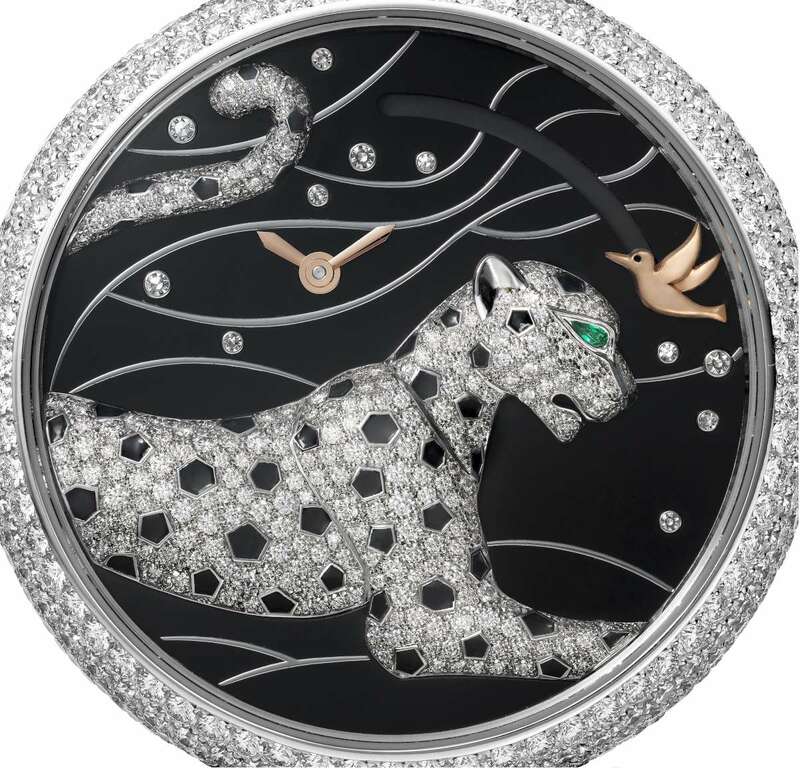 This is a watch for women by Cartier, and it tells a little story, rather like Van Cleef & Arpels’ poetic complications. The difference is that Van Cleef & Arpels’ stories are saccharine romantic, lovers meeting on a bridge at midnight to exchange a kiss, that sort of thing, while Cartier’s story is tougher. 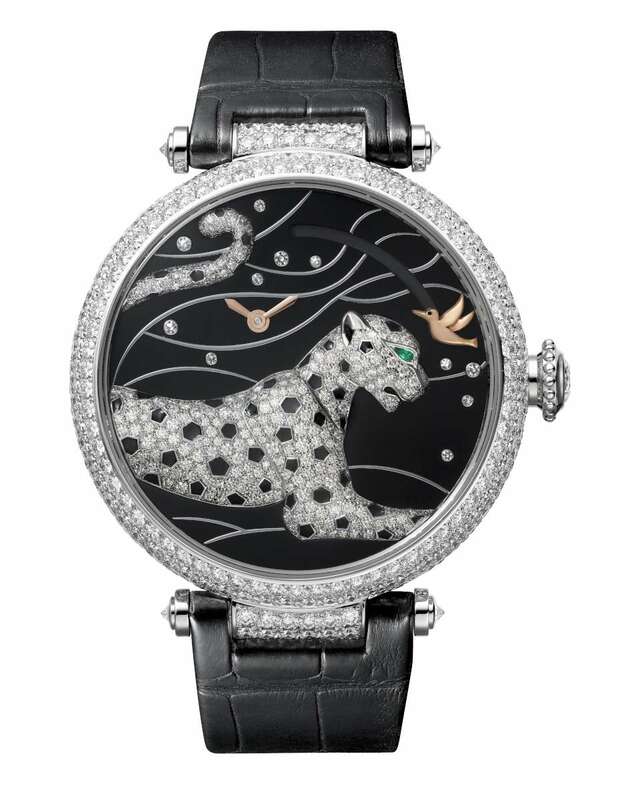 The panther, a classic Cartier motif since 1914, is sculpted from white gold with rhodium finish, and set with 270 diamonds, with a pear-shaped emerald for its eye. 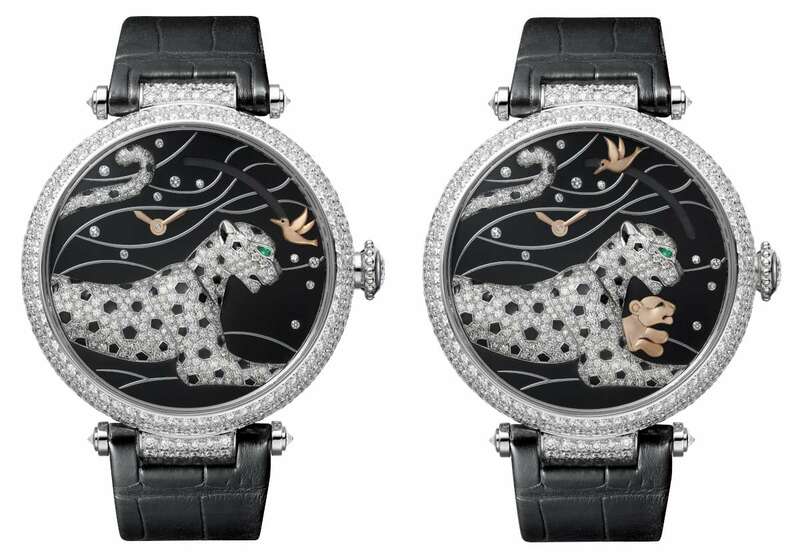 The spots on its coat are in black lacquer, while the background of the dial is made in black rhodium-finish white gold. Another 11 diamonds are placed on the dial. The composition is made more interesting by the panther’s tail, which appears on the dial from outside the watch, as it were. The hands are in gilded steel, and presumably also the cub and the humming bird. The watch is powered by the hand-wound calibre 9915 MC, with 367 components and about 72 hours power reserve. 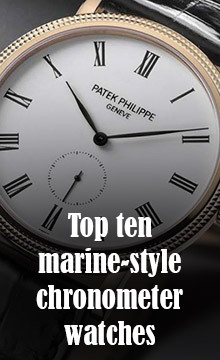 I can’t think of any other watches with a power reserve indicator on demand. Beautiful, brilliant, original.